View looking northeastward up the East Fork of the Big Lost River, west of Copper Basin. The sagebrush-covered bedded rocks across the river are conglomerates deposited immediately before eruption of the Eocene Challis Volcanic Group. The jagged dark rock in the middle, Castle Rock, is composed of andesite lava. On the horizon is Porphyry Peak, one of the centers of Challis volcanism, (July, 1993). Throughout Central Idaho, a flare-up of intrusion, volcanic activity, extensional faulting along northeast-striking faults of the Trans-Challis fault system, and formation of major mineral deposits, occurred in Eocene time from about 52 to 44 Ma. The general pattern is of intermediate or mafic volcanic activity first, with the biggest concentration at about 48 Ma, followed by granitic intrusion and eruption of rhyolite lavas at around 44 Ma. Much of the country between Mackay, Ketchum and Challis is covered with these volcanic rocks. Shallow intrusive igneous bodies, or plutons, formed at the same time. Coincident with the wave of extensional faulting of the Basin and Range was volcanic activity in the Snake River Plain-Yellowstone Province. The Snake River Plain-Yellowstone volcanic center originated about 17 million years ago near the southwest corner of Idaho. As the North American Plate has moved southwestward, this volcanic center has migrated in a northeast direction across southern Idaho, at the speed of 4.5 mm per year (rodgers and others, 1990; Pierce and Morgan, 1992). The most recent volcanic eruption was centered under Yellowstone Lake. The book "Roadside Geology of Idaho" (alt and Hyndman, 1990) attributes the origin of the Snake River Plain-Yellowstone Hot Spot to the impact of huge meteorite or "bolide." There is no geologic evidence for this rather outrageous claim. The bolide hypothesis is based on circumstantial evidence and provocative inference; it is hypothesis, not scientific fact. The general model for Snake River Plain-Yellowstone volcanism has been pieced together from the bits of exposed volcanic rocks in canyons and margins of the Snake River Plain. Readers should remember that though there is considerable evidence for much of this scheme, models of tectonic causes for the hot spot are hypotheses that must be tested further. View looking southwest along the axis of the Snake River Plain at East Butte, Middle Butte, and Big Southern Butte. The Pioneer Range is in the right background, (March, 1990). The "Hot Spot" or plume of heat generated in the earth's mantle, is thought to first melt the continental crust, producing explosive eruptions of light-colored lava or ash, with the composition of rhyolite. These eruptions coincide with collapse of calderas (topographic depressions formed after the rhyolitic volcanic eruptions) which form above what had been magma chambers. Deeper in the subsurface are slowly cooling batholiths of granite. The volcanic activity has generally migrated eastward, so that the rhyolite present in the Snake River Canyon near Twin Falls is about 10 million years old, the rhyolite cliffs southwest of Pocatello are 8 million years old, and the cliffs along the Snake River at Heise and at the southern end of the Lemhi Range are 4 million years old. After the rhyolite eruptions have ceased, dark lava known as basalt is erupted, and covers over the subsided rhyolite topography. The basalt lava which now covers the Snake River Plain, Gem Valley, and Blackfoot Lava fields is the product of this tail-end volcanic activity within the last 3 million years. Some of the basalt is erupted from fissures which extended northwest-southeast across the Snake River Plain. The Great Rift, from Craters of the Moon to the Crystal Ice caves near American Falls is one of these fissures. 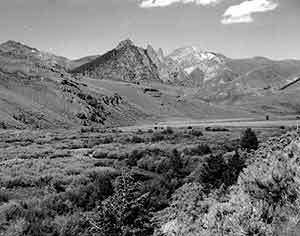 The three Buttes which rise above the surface of the basalt northwest of Blackfoot are products of rhyolite volcanic activity long after passage of the Hot Spot. They are rhyolite domes, produced by the squeezing up of thick, viscous rhyolite. They have domed up the cover of basalt, like strong slow monsters rising from a frozen lake. Big Southern Butte is dated at about 300,000 years. East Butte is about 600,000 years old. Rhyolite of the core of Middle Butte did not poke through the basalt cap, and cannot be dated. The reason Middle Butte has such a different profile from the other two, is that it exposes only tilted basalt lava flows, rather than the more irregularly weathering rhyolite. Small volcanic centers existed off of the main axis of the Snake River Plain. Three of these are the Massacre Rocks area southwest of American Falls (basalt only), the Hawkins Basin-Dairy Creek area in the Bannock Range north of Malad, and the Blackfoot Lava field north of Soda Springs. China Hat north of Soda Springs is a rhyolite dome in the Blackfoot Lava field. 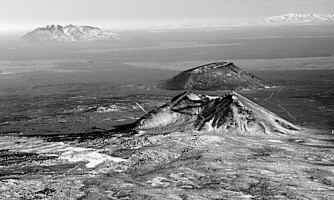 In the evolution of the passing volcanic center and topographic plateau, it is thought that after rhyolite eruptions cease, thermal doming of the land surface is reduced and the area subsides back to near its prior elevation. This is the basic reason why it is downhill from Yellowstone National Park to Boise. The Hot Spot now occupies the Continental Divide in Yellowstone and the country to the west has subsided in the wake of the mantle plume.